San Diego County Crime Stoppers and investigators from the San Diego Police Department’s Traffic Division are asking for the public’s help in identifying and locating the driver that struck a pedestrian in the Ocean Beach area of San Diego. On April 9, 2018, at six minutes after midnight, a 26-year-old good samaritan (victim) stopped to assist a disabled motorist who was parked along the west curb line of the 2900 block of Sunset Cliffs Boulevard near Robb Field. While the victim was standing next to the disabled vehicle, an unknown suspect driving southbound on Sunset Cliffs Boulevard struck the victim and the disabled vehicle. The suspect continued driving southbound and fled the scene. The victim was transported to a local hospital and sustained a fractured lower right leg and other internal injuries. The victim is now recovering at home. The suspect vehicle is described as a green 1998 or 1999 Subaru Outback Legacy wagon. The suspect vehicle will have right front end damage, including a damaged grill, fog lamp and right side mirror. Anyone with information on the identity or location of the suspect and or the suspect’s vehicle is asked to call SDPD’s Traffic Division at (858) 495-7805 or the Crime Stoppers anonymous tip line at (888) 580-8477. Please visit www.sdcrimestoppers.org for information on how to send a web or mobile app tip. Crime Stoppers is offering up to a $1,000 reward to anyone with information that leads to an arrest in this case. San Diego County Crime Stoppers and investigators from the San Diego Police Department’s Traffic Division continue to ask for the public’s help in identifying and locating the driver that struck and killed a pedestrian in the Mission Hills area of San Diego. On March 22, 2018, at approximately 12:22 a.m., a 57-year-old male was struck by a vehicle while he was crossing the 1300 block of W. Washington Avenue in the Mission Hills neighborhood of San Diego. After the collision, the vehicle fled the scene east on W. Washington Avenue. The pedestrian sustained fatal injuries as a result of the collision and was pronounced deceased at the scene. Investigators from the San Diego Police Department’s Traffic Investigation Unit responded to the scene. Based on their investigation, they believe the suspect’s vehicle is a 2001–2002 Hyundai Sonata with likely damage to the front of the vehicle including its headlamps and or windshield. San Diego County Crime Stoppers and investigators from the San Diego Police Department’s Traffic Division are asking for the public’s help in identifying and locating the driver that struck a pedestrian in the Mission Hills area of San Diego. Today (March 22, 2018) , at approximately 12:22 a.m., a 57-year-old male was struck by a vehicle while he was crossing the 1300 block of W. Washington Avenue in the Mission Hills neighborhood of San Diego. After the collision, the vehicle fled the scene east on W. Washington Avenue. The pedestrian sustained fatal injuries as a result of the collision and was pronounced deceased at the scene. Inquiries about this case or Crime Stoppers can be directed to SDPD Officer Mark Herring at (619) 531-1500 or msherring@pd.sandiego.gov . San Diego County Crime Stoppers and investigators from the San Diego Police Department’s Traffic Division are asking for the public’s help in identifying and locating the driver that struck a pedestrian in the Mountain View area of San Diego. On December 15, 2017, at about 8:24 p.m., a dark colored vehicle was traveling westbound on the 3700 block of Ocean View Blvd. The vehicle struck a 33-year-old male pedestrian as he was walking northbound across the street near the intersection of Ocean View Blvd. and Milbrae Street. The vehicle immediately fled the scene and was last seen traveling westbound on Ocean View Blvd. The pedestrian suffered a severe brain injury and remains hospitalized in critical condition. The suspect’s vehicle is described as a dark colored 2008-2010 Scion TC. Anyone with information on the identity or location of the suspect and or the suspect’s vehicle is asked to call SDPD’s Traffic Division at (858) 495-7813 or the Crime Stoppers anonymous tip line at (888) 580-8477. Please visit www.sdcrimestoppers.org for information on how to send a web or cell phone tip. Crime Stoppers is offering up to a $1,000 reward to anyone with information that leads to an arrest in this case. 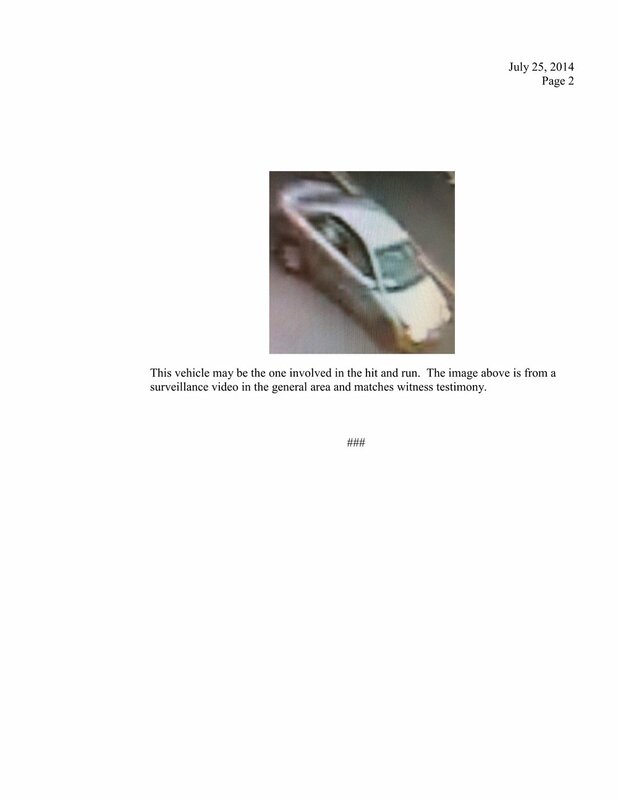 Suspect’s Vehicle Description: The hit and run vehicle is described as a newer silver SUV with a tinted sunroof and possibly tinted windows. It also had chrome rims. The SUV had its fog lights and headlights activated and may have front end and undercarriage damage. Media inquiries about this case can be directed to Traffic Division Det. Sgt. Tim Underwood at (858) 495-7843 or via email at tlunderwood@pd.sandiego.gov OR Det. Sgt. Victoria Houseman at (858) 495-7841 or vhouseman@pd.sandiego.gov. San Diego County Crime Stoppers and investigators from the San Diego Police Department’s Traffic Division are asking for the public’s help in identifying and locating the driver wanted for vehicular manslaughter and felony hit and run in the East Village area of downtown San Diego. On October 2, 2017, at about 7:10 a.m., a red, newer model, Ford Escape was stopped in the northbound lane in front of 500 15th Street in San Diego when a 46-year-old female and her male companion walked to the front passenger side of the vehicle. As a conversation took place between the female and the driver, the female reached into the vehicle. For unknown reasons, the driver accelerated, dragging the female about 15 feet before she fell from the vehicle and landed on her head. The suspect fled northbound on 15th Street. The female victim was transported to a local hospital where she died one day later (10-3-17) from a head injury. The driver of the vehicle is described as a White male, in his 60’s, with white hair and a white trimmed full beard. The suspect’s vehicle is described as a red, newer model, Ford Escape. It has a California license plate that is similar to 7WGO798. Note: That is not the correct license plate but it could be something close to that. 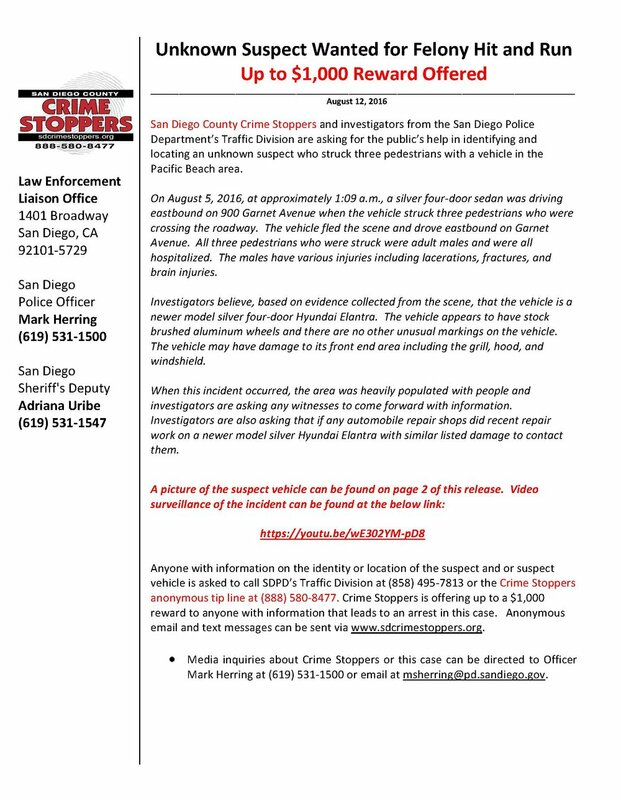 Anyone with information on the identity or location of the suspect and or the suspect’s vehicle is asked to call SDPD’s Traffic Division at (858) 495-7808 or the Crime Stoppers anonymous tip line at (888) 580-8477. Please visit www.sdcrimestoppers.org for information on how to send a web or mobile app tip. Crime Stoppers is offering up to a $1,000 reward to anyone with information that leads to an arrest in this case. San Diego County Crime Stoppers and investigators from the San Diego Police Department’s Traffic Division are asking for the public’s help in identifying and locating the driver that struck a pedestrian in the Mira Mesa area of San Diego. On August 19, 2017, at approximately 8:00 p.m., an adult male pedestrian was walking southbound across the 8200 block of New Salem Street, in San Diego. A black colored 2-door vehicle was driving eastbound on New Salem Street, failed to yield to the pedestrian, and struck him. Immediately after striking the pedestrian, the driver fled the scene and was last seen driving southbound on Camino Ruiz. The victim suffered fractures to his skull, pelvis and left leg. The victim is still recovering from his injuries and is in a rehabilitation facility. The suspect’s vehicle is described as a “domestic” black colored 2-door vehicle. The vehicle may have minor front end damage. There is no description of the driver. San Diego County Crime Stoppers and investigators from the San Diego Police Department’s Traffic Division are asking for the public’s help in identifying and locating the person responsible for colliding with a motorcyclist and then fleeing the scene in the Pacific Beach area. On May 20, 2017, at 2:15 p.m., the driver of a silver colored Jeep Grand Cherokee was stopped in traffic along the northbound # 1 lane of 4500 Mission Bay Drive. The driver of the Jeep made an illegal U-turn into the southbound lanes. A motorcyclist was traveling southbound in the # 1 lane of 4500 Mission Bay Drive and struck the rear end of the Jeep. The motorcyclist was immediately ejected into the air upon impact and landed in the roadway with a severe leg injury. The driver of the Jeep did stop, ran towards the victim, and then immediately turned around and got back into the Jeep. The driver fled the scene and was last seen getting onto southbound Interstate 5. The motorcyclist suffered fractured bones in his right leg and remains hospitalized pending a second surgery. The suspect is described as an unknown race male wearing a blue shirt. The suspect’s vehicle is described as a possible 2014 or newer silver colored Jeep Grand Cherokee with a possible rear yellow paper plate or out of state plate. The Jeep sustained moderate rear end damage including a shattered rear windshield. Investigators are asking anyone who may have recorded any part of this incident on their cell phone to please contact them. Anyone with information on the identity or location of the suspect or suspect’s vehicle is asked to call SDPD’s Traffic Division at (858) 495-7808 or the Crime Stoppers anonymous tip line at (888) 580-8477. Crime Stoppers is offering up to a $1,000 reward to anyone with information that leads to an arrest in this case. Anonymous email and text messages can be sent via www.sdcrimestoppers.org. San Diego County Crime Stoppers and investigators from the San Diego Police Department’s Traffic Division are asking for the public’s help in identifying and locating the driver that struck and killed a pedestrian in San Carlos. On November 26, 2016, at about 5:45 a.m., a man was walking north, across Blue Lake Drive, along Jackson Drive, using the unmarked crosswalk in the San Carlos neighborhood when he was struck by a vehicle. The suspect vehicle was traveling south on Jackson Drive and made a left turn onto Blue Lake Drive. The pedestrian died as a result of the injuries that he suffered at the collision scene. Traffic detectives are looking for an unknown motor vehicle that sustained a damaged front bumper, mostly on the left side. Anyone with information on the identity or location of the suspects and or suspects’ vehicles is asked to call SDPD’s Traffic Division at (858) 495-7808 or the Crime Stoppers anonymous tip line at (888) 580-8477. Crime Stoppers is offering up to a $1,000 reward to anyone with information that leads to an arrest in this case. Anonymous email and text messages can be sent via www.sdcrimestoppers.org. Media inquiries about Crime Stoppers can be directed to Deputy Adriana Uribe at (619) 531-1547 or email at adriana.uribe@sdsheriff.org or SDPD Officer Mark Herring at (619) 531-1500 or msherring@pd.sandiego.gov .